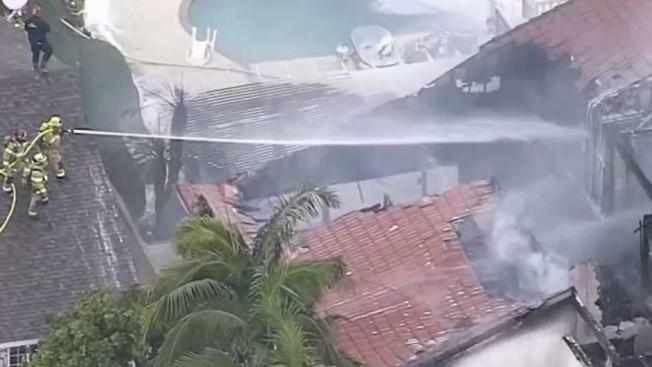 A small plane shook homes and "sounded like a missile" as it broke apart and rained chunks of metal into a Southern California neighborhood, igniting a house fire that killed four people, witnesses said Monday. "The witnesses I've spoken with say that they saw the airplane coming out of the clouds — it was still in one piece — and then they saw the tail breaking off and then the wing breaking off and then something like smoke before the airplane impacted the ground," said Maja Smith, an investigator with the National Transportation Safety Board. Antonio Pastini, 75, of Gardnerville, Nevada, was the only person aboard, Orange County Sheriff's Lt. Cory Martino said. Yorba Linda resident Dave Elfver said he was getting ready to go to a friend's house to watch the Super Bowl when he heard a whining sound "like a motorcycle going a hundred miles per hour." Shawn Winch, 49, said he was in his backyard when he heard what "sounded like a missile coming at my house." He said he saw the plane veer off and debris falling. "It wasn't intact," he said as the plane came toward the neighborhood. "It was already breaking up." A portion of the plane's right wing had not been found, and investigators would search the burned house, Smith said. The Cessna 414A carries fuel in its wings. Investigators will look into the maintenance record structural integrity of the aircraft, as well as the pilot's record, Smith said. The wreckage will be transported to Phoenix, Arizona, for a forensic examination. Associated Press journalists John Antczak, Amanda Lee Myers and Christopher Weber in Los Angeles contributed to this report.